We have collaborated with dozens of universities to create a signup flow for students that is simple and transparent. 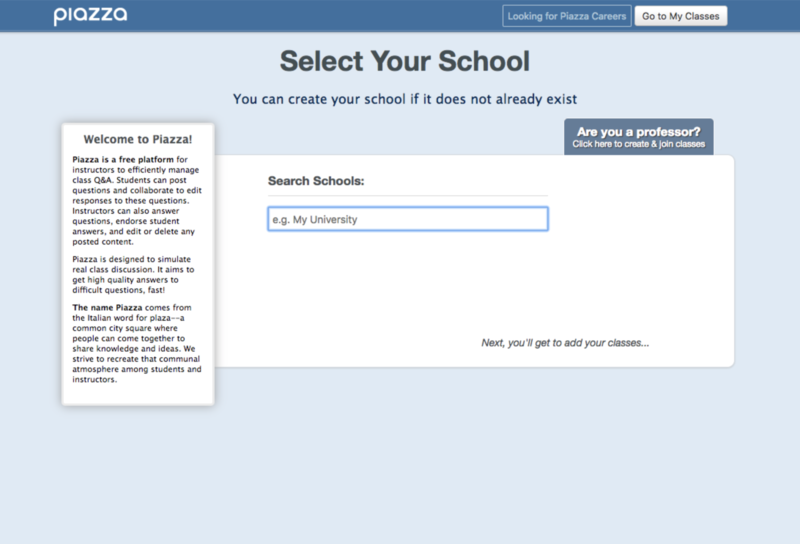 Students visit piazza.com to get started, and follow the prompt “Students Get Started”. They are taken to a page where they can find their school by name or email domain. They are then taken to a page where they are prompted to find the class that their professor will have set up for them. They may need to adjust the Term drop down if they enrolling in a non-default term. Students may need to provide an access code if professors have set one up for their class. They will be required to provide a valid school email address where their school is affiliated with an email domain. They will receive an enrollment confirmation email, with a link to set up their account. When students set up their account, they are prompted to fill out basic account information (name, preferred email, password) and basic academic information (major, grad year, grad month, program). Students can also indicate that they are not pursuing a degree if that is the case. Once students are done setting up their account on Piazza, they are taken to a standalone page with a clear optional message to join the Piazza Network - a careers-oriented product offering that connects students with employers. The two options that are presented to students are - “Join the Network”, “Don’t Join the Network”. Neither option are selected by default. 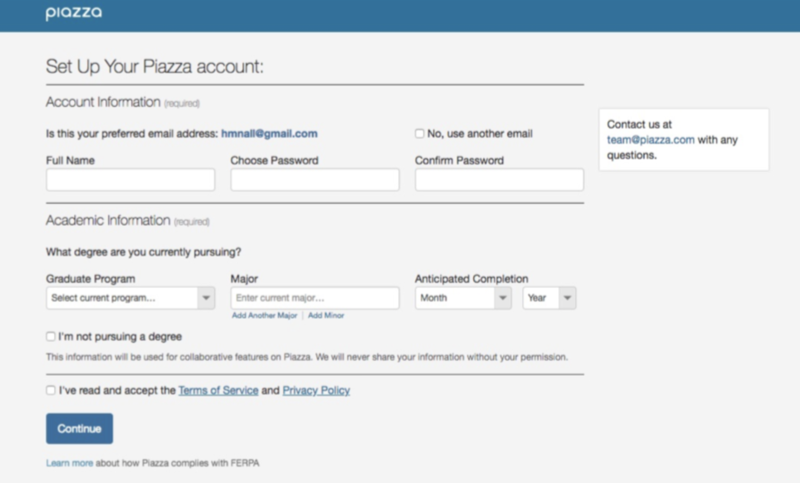 This page lists out the features that come with joining the Piazza Network and with not joining. 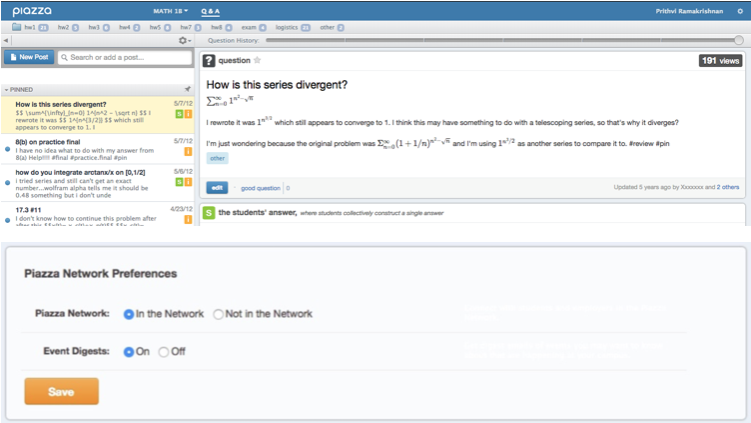 It is made clear in the first row that students are able to access all class Q&A discussion even if they were to select not to join the network. If a student proceeds without selecting either option, they are not joined into the network. Learn about the Piazza Network at piazza.com/network. Display relevant section of Terms of Service upon selecting "Join the Network"
Should students choose to join the Piazza Network, they are taken to the relevant section of our Terms of Service (via a pop-up modal window), which highlights what information of theirs is shared with students and employers in the Piazza Network. They are required to click an “I Agree” button before they can proceed to join the Piazza Network. They can choose to cancel this window in which case they have not joined the Piazza Network. They are taken back to the prior page and can change their selection before proceeding. Students who select "Don't Join the Network" are not presented with this pop-up modal. 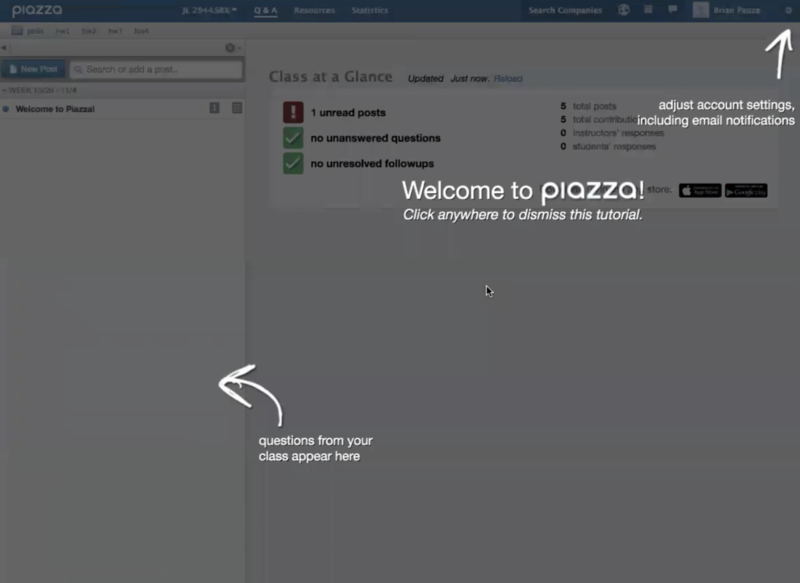 Students are then taken to their class home page on Piazza, where they are able to collaborate and communicate with fellow students, TAs and instructors in their class. 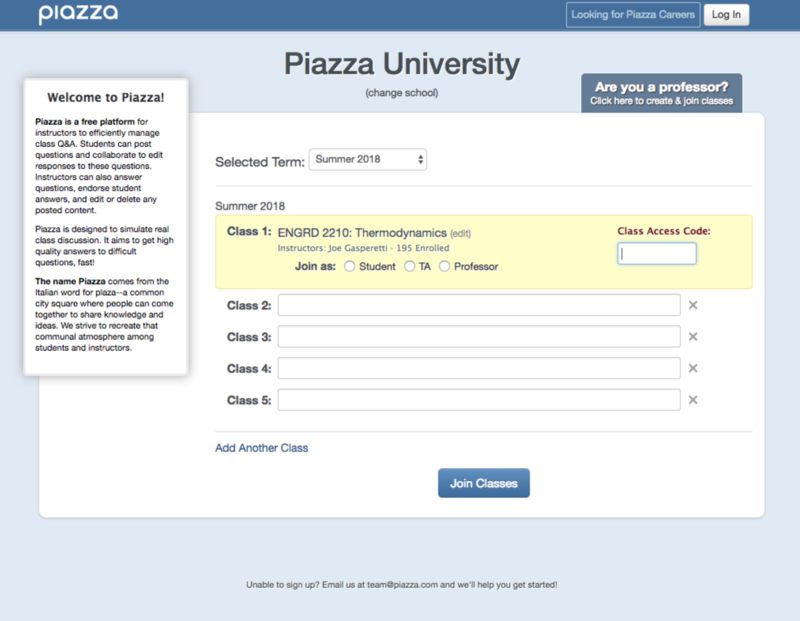 From the top right dropdown in their class home page (top image), students can visit their Account Settings page to toggle their selection for the Piazza Network (bottom image). 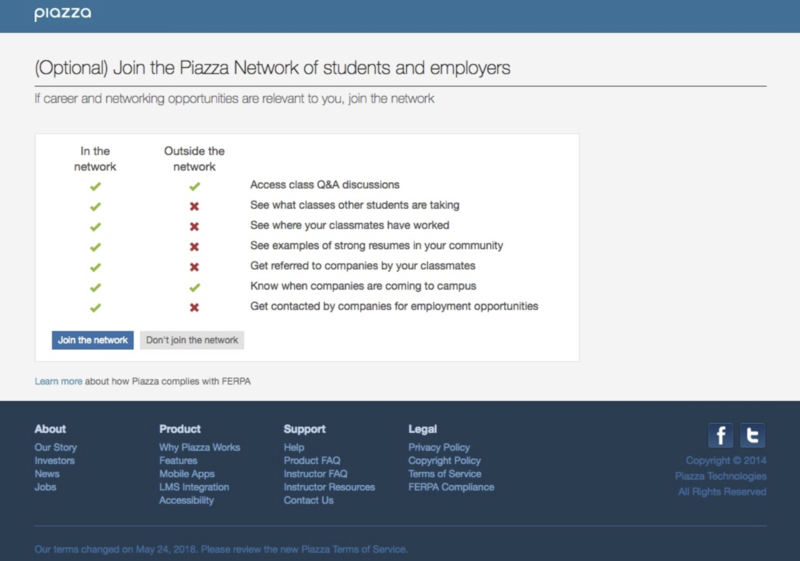 If they select to join the Piazza Network from here, they will be taken to the relevant section of our Terms of Service (via a pop-up modal window), which highlights what information of theirs is shared with students and employers in the Piazza Network. They are required to click an “I Agree” button before they can proceed to join the Piazza Network.